Indianapolis is a major Midwestern metropolis, with no end of attractions for curious visitors. A walking tour of the city includes major landmarks such as the Indiana State Capitol building, the Soldiers and Sailors Monument, the Indiana War Memorial, and the Scottish Rite Cathedral. On pleasant days, Indianapolis has a number of parks and gardens to enjoy, including the White River Gardens, Garfield Park Conservatory, the Oldfields-Lilly Estate, and of course the Indianapolis Zoo. There are plenty of cultural attractions in Indianapolis, as the city boasts more than a dozen excellent museums. 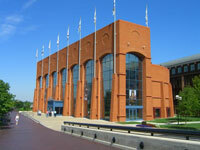 Families will want to visit the Holbomb Observatory and Planetarium and the Children's Museum of Indianapolis; while history buffs can enjoy the Conner Prairie Living History Museum, the Indiana State Museum, the Eiteljorg Museum of American Indians and Western Art, and The Benjamin Harrison Presidential Site. The city also offers a number of art galleries and performing arts venues, and is home to fun summer events like the Indiana State Fair, the Rib America Fest, Bands of America Grand Nationals, and the Indy Fringe Festival.